Editorial: Who is driving the treatment plan? Objective: The objective of this study was to evaluate the influence of delayed light curing on a dual-cured composite resin on cuspal deflection, microleakage, and enamel cracks. Method and materials: Forty-eight standardized Class 2 cavities were prepared in maxillary third molars and restored with a dual-cure composite resin (Core-X Flow) in bulk-fill technique. The samples were divided into four groups (n = 12) and either self-cured (1) or light cured immediately (2), with 1 minute (3) or 2 minutes of delay (4) after placement. Cuspal deflection was measured before preparation, 6 minutes after placement, after 24 hours, and after 120 days of storage and thermocycling. The margins of the restorations were examined under a stereomicroscope after 24 hours and 120 days. Samples were immersed in a 0.2% basic fuchsin solution for 24 hours at room temperature and then sectioned vertically and mesiodistally, and dye penetration and enamel cracks were recorded under a stereomicroscope using a scoring system. Results: Six minutes after placement the cuspal deflections were between 20 ± 2.1 µm and 39.3 ± 1.9 µm. After 120 days the cuspal deflection in all groups was reduced to almost complete recovery, while the percentage of perfect margin decreased. Differences in microleakage, dye penetration, and enamel cracks were observed between different locations but not between the groups. Statistical analysis did not show a correlation between cuspal deflection, margin quality, or enamel cracks. Conclusion: A short delay in light curing of a dual-cure composite resin could significantly reduce the initial cuspal deflection measured 6 minutes after light curing, thereby probably reducing the polymerization shrinkage stress. However, the curing mode did not significantly influence microleakage and enamel cracks. It is challenging for clinicians to carry out successful periodontal therapy and maintain a full dentition in young patients with generalized bone loss of 90%. Due to advanced attachment loss and the young age of patients, fixed or removable prosthetic treatment options are compromised. Implant therapy would be complex and expensive. The presented case shows the successful conservative periodontal therapy of advanced generalized aggressive periodontitis in a 29-year-old female. A conservative approach was applied and maintained all teeth with patient satisfaction both functionally and esthetically. This case was followed over 5 years. The aim of this study was to evaluate long-term outcomes in a 10-year follow-up study of patients who previously completed a 3-year multicenter randomized controlled trial of immediate and early loading of dental implants with a hydrophilic and chemically active surface (SLActive) in the posterior maxilla or mandible. The patients received implants to replace at least one missing tooth, with provisional restoration on the day of surgery (immediate loading) or 28 to 34 days later (early loading). Implant survival, change in crestal bone level, and patient satisfaction were evaluated. In total, 56 patients (with 72 implants) were available after 10 years and fulfilled the criteria for the radiographic bone level evaluation. The mean crestal bone level change from implant surgery to 10 years was -2.00 ± 1.19 mm and -1.37 ± 1.06 mm in the immediate and early groups, respectively. The corresponding change between 5 to 6 months' post-surgery (permanent fixed restoration placement) and 10 years was -1.25 ± 0.99 mm and -0.89 ± 1.11 mm in the immediate and early groups. After the initial remodeling phase (5 to 6 months) where the depth of implant placement had an influence on the initial bone remodeling, no significant differences between the two treatment groups were detected. Mean implant survival was 97.6% (98.2% and 97.1% in the immediate and early loading groups, respectively). Implants with the SLActive surface show successful long-term outcomes following immediate or early loading in posterior maxillae and mandibles. The use of hormonal anti-inflammatory drugs is a common practice in oral and dental surgery. They have proven enhanced efficacy, increasing therapeutic success when the treatment is properly chosen and managed. However, given the complexity of neurophysiologic processes, little is known regarding the consequences of administering glucocorticoids on brain function. This article aims to bring to the attention of dental health professionals the main neurophysiologic mechanisms by which glucocorticoid hormones can affect memory and attention. In addition, in the context of increasing global prevalence and incidence of cannabinoid consumption, both for medical and recreational purposes, the issue of the association of cortisone-derived drugs in the systemic context of these phytocannabinoids is addressed, in terms of memory issues and attention. Objective: The aim of this article is to investigate, study, and summarize cone beam computed tomography (CBCT)-related guidelines offered by relevant organizations and associations within North America to provide the dental practitioner a clearer direction on the practice of CBCT-related procedures in North America. Data sources: Scientific databases including PubMed, Science Direct, Scopus, MedLine, and Web of Science were used for the search of relevant literature on the CBCT guidelines developed in North America. In addition, the World Wide Web was searched for comparative CBCT guidelines nationally or internationally using the same search strategies. Conclusion: In 1999, the American Dental Association (ADA) recognized Oral and Maxillofacial Radiology as the ninth dental specialty in the United States. The American Academy of Oral and Maxillofacial Radiology (AAOMR) issued their first statement on the use of CBCT in 2008. There have since been several statements issued, independently or jointly with other specialty organizations, related to the use and interpretation of the CBCT volumes. 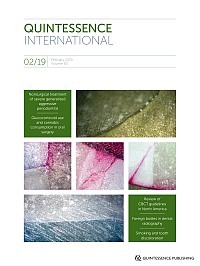 The guidelines identified Oral and Maxillofacial Radiologists (OMR) as providers of interpretative services, portrayed as key players in the dissemination of information related to CBCT, implementation of CBCT-related services and radiation protection, as well as interpretation assistance for CBCT volumes, especially medium to large volumes covering anatomical areas of head and neck, considered beyond the scope of a general dentist. Regulations concerning radiation-producing devices are promulgated through state health codes and practice acts. Selection criteria and interpretation of imaging studies are left to the clinician's choice and abilities. Objectives: The purpose of the present study was to determine the presence of radiopaque foreign bodies on oral and maxillofacial radiographs and classify them. Method and Materials: The Study Comment section of the Picture Archiving and Communication System of Chonnam National University Dental Hospital was searched using 30 key words to identify images with radiopaque foreign bodies recorded between November 2008 and March 2017. A total of 503 cases of radiopaque foreign bodies were selected from among the recovered images. The radiopaque foreign bodies were sorted into 19 types, which were subsequently divided into two categories according to whether the foreign bodies were inserted intentionally or unintentionally. The two categories were subdivided into five groups based on the cause of insertion: Treatment, Esthetics, Cultural, Iatrogenesis, and Accident. Results: In this study, the proportions of foreign bodies inserted intentionally (48%) and unintentionally (52%) were similar. When the foreign bodies were grouped based on the cause of insertion, the following frequencies were observed: Treatment, 41%; Esthetics, 7%; Cultural, <1%; Iatrogenesis, 51%; and Accident, 1%. Conclusion: For adequate case management and to avoid unnecessary embarrassment and misinterpretation of unexpected radiopacities, clinicians should be familiar with the various types of foreign bodies and should ensure that detailed patient medical/dental history is obtained. Objectives: To test if cigarette smoke (CS) causes discoloration of enamel, dentin, and composite resin restorations and induces color mismatch between dental hard tissues and the restorations, and to compare the findings with the effects of aerosol generated by the tobacco heating system (THS) 2.2. Method and materials: Twenty-two human premolars were prepared with Class V cavities restored with Filtek Supreme Ultra (3M Espe) composite resin. Teeth were divided into two groups and exposed to either CS from 20 reference cigarettes (3R4F) or aerosol from 20 THS 2.2 tobacco heat sticks 4 days a week for 3 weeks. CIE L*a*b* color was assessed before and after exposure and brushing at 1, 2, and 3 weeks. Color match, marginal discoloration, marginal integrity, and surface texture of the Class V restoration were assessed according to a modified US Public Health Service (USPHS) criterion. Results: Marked discoloration of enamel and dentin was observed following 3 weeks of CS exposure (ΔE = 8.8 ± 2.6 and 21.3 ± 4.4, respectively), and color mismatch occurred between the composite resin restorations (ΔE = 25.6 ± 3.8) and dental hard tissues. Discoloration was minimal in the enamel, dentin, and composite resin restorations in the THS 2.2 group, and no color mismatch was observed after 3 weeks of THS 2.2 aerosol exposure. Conclusion: CS causes significant tooth discoloration and induces color mismatch between dental hard tissues and composite resin restorations. Reducing or eliminating the deposits derived from tobacco combustion could minimize the impact of tobacco products on tooth discoloration.